Growing up we had an incredibly varied diet and regularly ate dishes from other cultures. But there was one cuisine I didn’t try until I met my husband in my early twenties. I remember my first taste of Thai Green Curry and I’ve been hooked on the beautifully aromatic and fragrant flavours ever since. Thai Green Curry is my favourite Thai meal to recreate at home. To help, I use the curry kits from Thai Taste, they are essential for capturing the fresh and tangy flavour in a truly authentic way. Thai Taste Green Curry Kit is made in Thailand with fresh ingredients including green chilli, lemongrass, black ginger, galangal and kaffir lime peel. 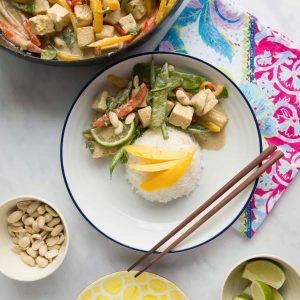 Thai Taste bring restaurant quality food and flavour to your kitchen and the best thing is they don’t take hours to prepare – a Thai Green Curry made with tofu takes under 15 minutes. Win a trip to Thailand for two! If you enjoy Thai food then my guess is you’d love to visit Thailand? Well, you could be doing just that thanks to the exciting competition Thai Taste have running for the remainder of January 2019. Thai Taste is giving away an exceptional ten-day trip to Thailand for two, including return flights from London to Bangkok. Nine nights’ stay in Thailand’s finest hotels, plus private guided tours of Bangkok and Chang Mai with an itinerary packed full of once in a lifetime experiences. Sounds incredible, right? For your chance to win all you have to do is pick up one of Thai Tastes meal kits: Thai Green Curry, Thai Red Curry or Pad Thai. On the packs, there is a unique code that can be entered into the prize draw section on the Thai Taste website. Each kit also has a 75p off next purchase coupon and 150 runners up will win a signed cookbook full of inspiring Thai dishes from chef Sebby Holmes. To celebrate this incredible competition and because I don’t need an excuse to eat Thai food (!) I’ve recreated Thai Taste’s steps to make the perfect, easy Thai Green Curry which I’ll be sharing with you today. I recommend taking the time to pair this wonderful Thai Green Curry with Thai Taste’s Sticky rice. It takes slightly more time to prepare than regular rice but there’s nothing like an authentic sticky rice side dish to go alongside your favourite green curry. Why not have a go yourself and see how simple it is to make this delicious Thai meal. 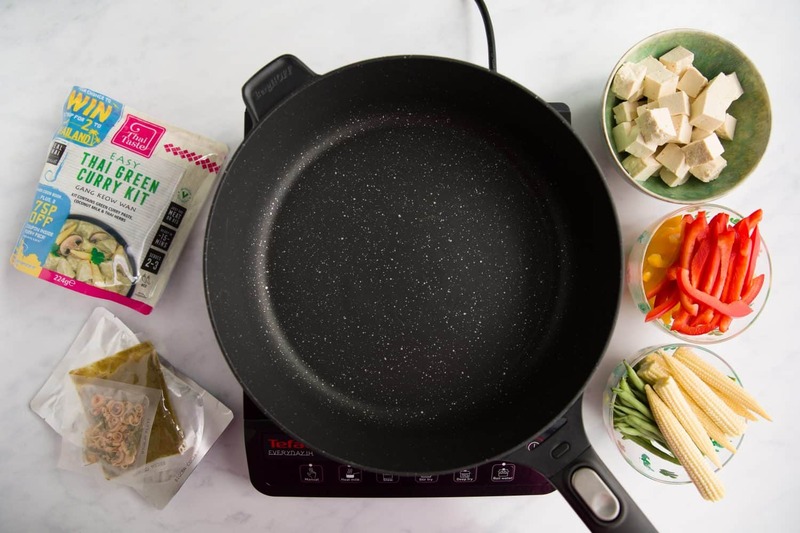 To make this easy Thai Green Curry you will need: one Thai Taste Thai Green Curry Kit (kit contains green curry paste, coconut milk and Thai steamed herbs), 300g tofu, 300g vegetables (I used red and yellow pepper, baby sweetcorn, green beans and mangetout), 1 tbsp oil. I hope you love this Thai Green Curry as much as we do. 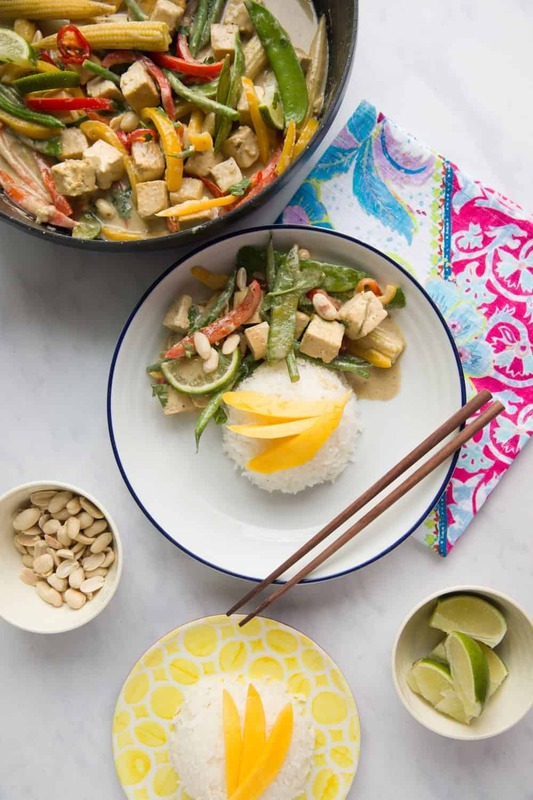 The Thai Taste curry kits make it so easy to recreate authentic Thai meals at home. Don’t forget to pick up your promotional pack before the end of January 2019 and you could be in with winning a trip of a lifetime for two to Thailand! If you enjoyed this, check out my recipe index for more curry recipes. Thai Taste’s meal kits are available in a number of retailers including Waitrose, Tesco, Sainsbury’s, Asda and Ocado. The most classic and favourite of Thai curries is this fresh, tangy and aromatic Green curry. We've made ours vegetarian by using tofu and added lots of colourful veggies to make a truly delicious Thai meal.